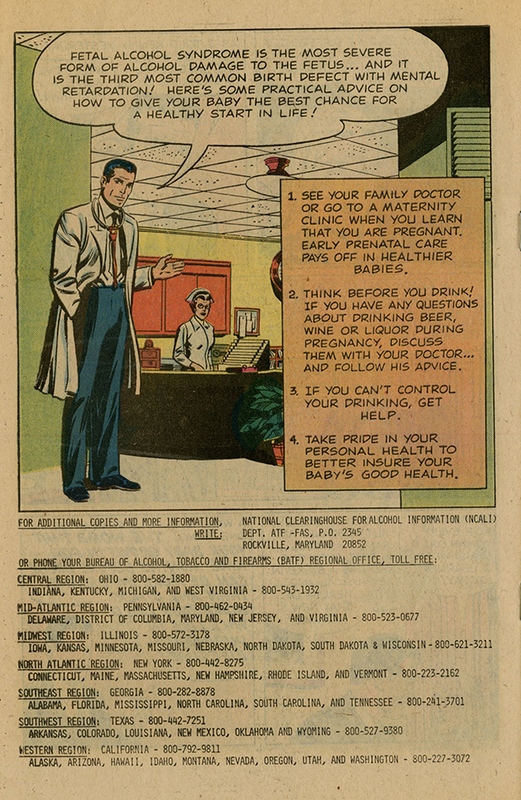 Educational comic book about the dangers of drinking while pregnant and Fetal Alcohol Syndrome. Sponsored by the U.S. Department of the Treasury, Bureau of Alcohol, Tobacco and Firearms. 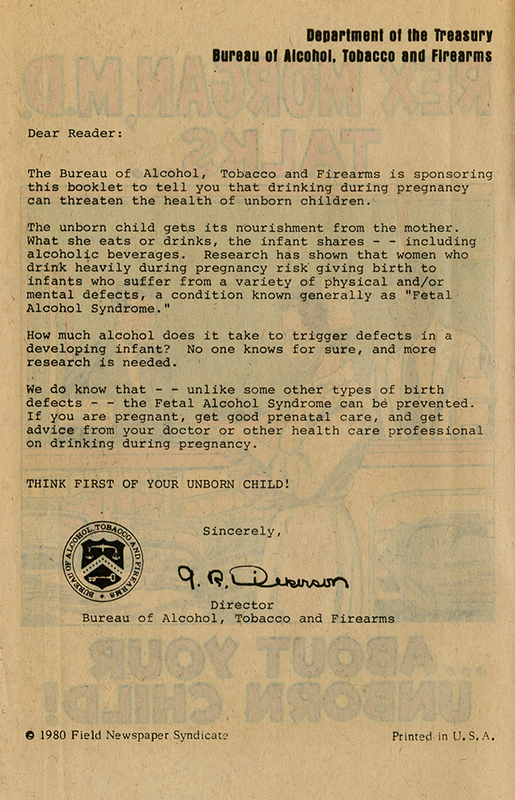 Inside front cover contains a letter signed by G. R. Dickerson, Director of the ATF. Plot: An pregnant woman comes into the hospital having injured her hand badly after drinking and falling at a party. 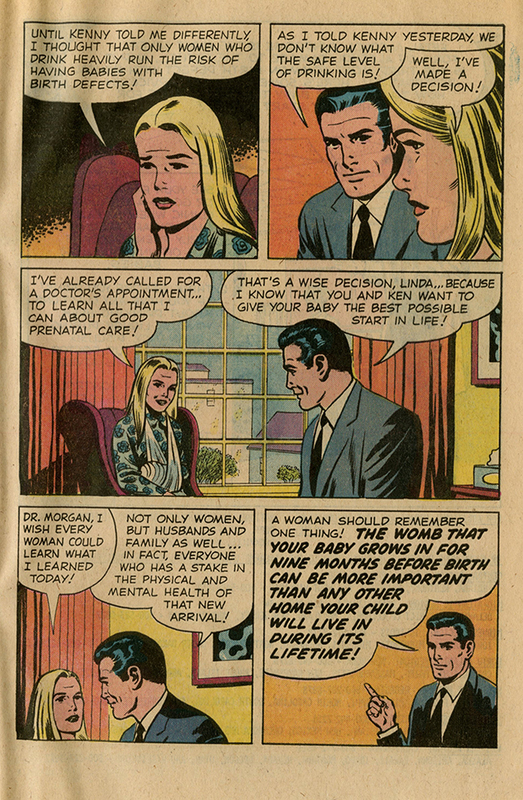 Dr. Morgan speaks to her about the danger alcohol presents to her unborn child. From letter: "The unborn child gets its nourishment from the mother. What she eats or drinks, the infant share - - including alcoholic beverages. Research has shown that women who drink heavily during pregnancy risk giving birth to infants who suffer from a variety of physical and/or mental defects, a condition known generally as "Fetal Alcohol Syndrome." From comic: "A woman should remember one thing! The womb that your baby grows in for nine months before birth can be more important than any other home your child will live in during its lifetime!" 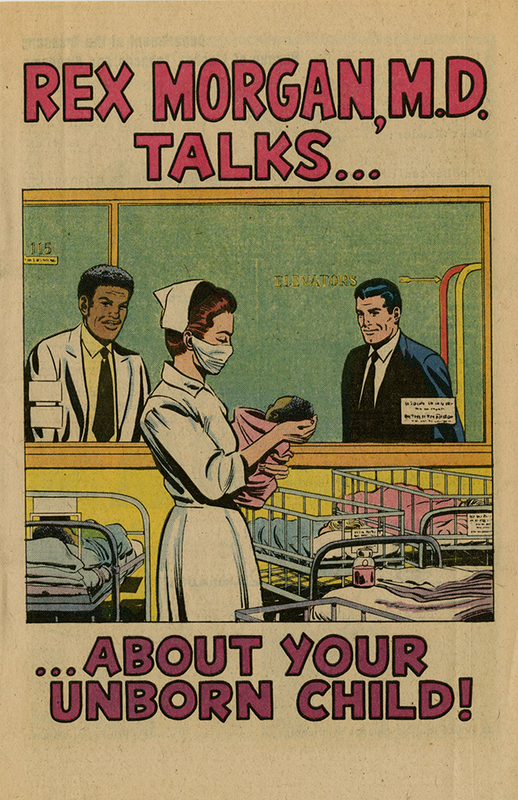 “Rex Morgan, M.D. Talks About Your Unborn Child! ,” Social Welfare History Image Portal, accessed April 26, 2019, https://images.socialwelfare.library.vcu.edu/items/show/353.